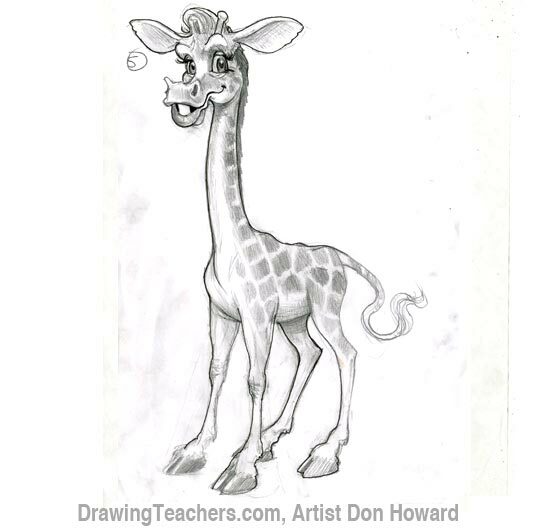 Have you ever wanted to draw a giraffe? 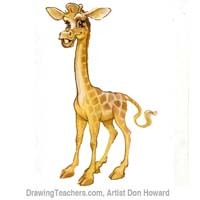 Maybe you want to draw an easy giraffe cartoon for a Noah’s ark picture. A jungle safari picture including a giraffe illustration would be fun to draw, too! 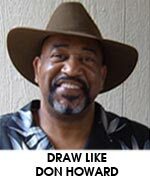 If you follow Don Howard’s easy step by step instructions, I know you can do it! This is an easy to draw cartoon animal. 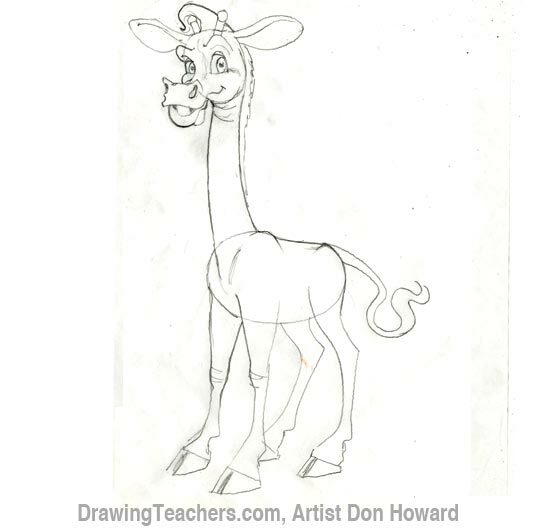 How to draw a giraffe: Giraffes are tall, gentle, beautiful animals. Known for their long necks and lovely brown patterned fur, giraffes eat mostly leaves. I was at a petting zoo and got to feed a giraffe some corn out of my hand. I was so surprised to find out it had a long, long tongue-- it can be up to 18 inches long! As the tallest animals in the world, they stand from 14 to 18 feet tall! Look at your room door. It’s about 6 feet tall. A male giraffe is as tall as three of your room doors stacked on top of each other! He’s tall!! Most everyone knows Geoffrey the Giraffe-- he’s the Toys R Us mascot. He’s a cute giraffe, too. Another famous cartoon giraffe is Melman from Madagascar. I think artists like to draw giraffes because of their exaggerated features: The big feet, the long legs, the beautifully patterned skin, the long neck, the big eyes. 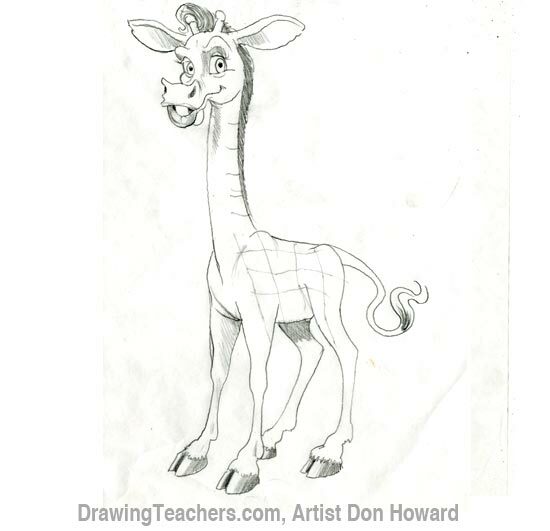 If you look at Don Howard’s drawing, you’ll see how each part is either long or big or bold. 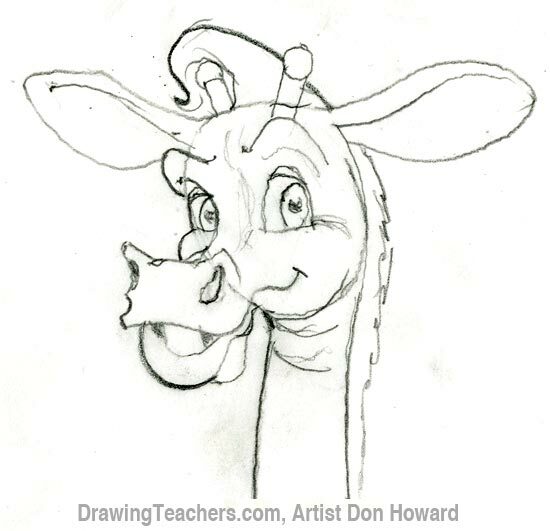 You can draw a cute cartoon giraffe, too. This one-of-a-kind animal fascinates many cultures. The German artist Martin Missfeldt takes famous paintings like the Mona Lisa by Da Vinci, and makes them into funny cartoon giraffes! Maybe he got his inspiration from the Kiffian people in Africa a long time ago. They made huge etchings of giraffes on rocks. The giraffes unique appearance made it a mystery to the ancient Greeks and Romans who thought it was a combination of a camel and a leopard, while Arab poets wrote verses about this graceful animal. 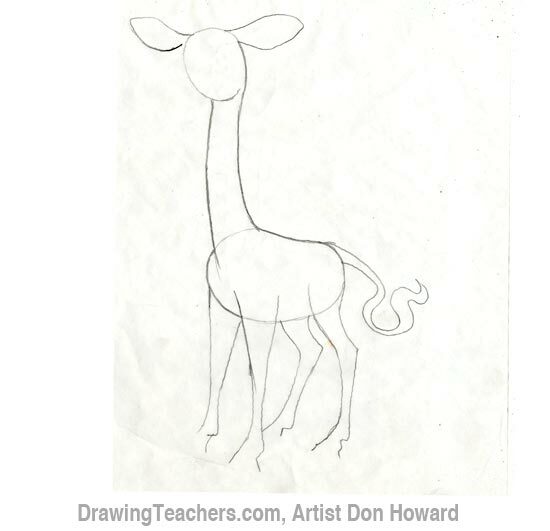 "How to Draw a Giraffe!"